Your roof gutters may have been designed to handle rainfall, but if you live in the northern climes, your gutter system may also have to handle winter storms and the subsequent melting snow. While the amount of snowmelt you experience will differ from year to year, melting snow nevertheless always poses hazards to you and your home. From falling ice that can damage your car to black ice that can form on the ground below your roof’s drip line and cause potentially serious injuries, snowmelt poses many dangers – even some that you may not even think about, such as seepage into your basement. Your roof gutters play an integral role in protecting you and your property from the hazards of snowmelt, especially considering that a foot of snow on a 1,000-square-foot-roof will produce roughly 2,500 gallons of water. And, since this water will likely be running off your roof over a period of several days, your gutters could be overwhelmed by a steady torrent of water that won’t relent until the warm springtime sun melts the last vestiges of winter off your roof. Use roof gutters, leaders, and downspouts that will direct snowmelt and rain runoff at least 10 feet away from the foundation of your home. Doing so will help prevent costly water damage in your basement and around your home’s walls. Use plastic or concrete dry wells to catch water running out of the end of your downspouts. This will help keep prevent copious amounts of water from pooling in your yard and can also help prevent landscape erosion caused by water gushing out of your downspouts. 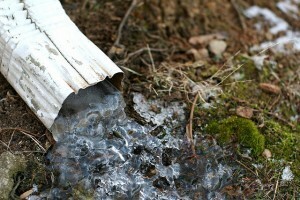 If your roof doesn’t have gutters and you’re not in a financial position to have them installed before spring rolls around, consider installing an inexpensive water runoff collection system at the drip line under the eaves of your roof; a drip line runoff system can be built by laying perforated piping in a trench lined with plastic. Surround the pipe with stones or gravel and then cover the trench with landscaping. Install a gutter heat cable inside your roof gutters. These deicing cables plug into your home’s main electrical system and will prevent ice from forming along your gutters and drip line. While snow melting cables won’t stop snow from accumulating on your roof, it will help prevent the heavy accumulation of snowflakes and formation of gutter ice and icicles that can potentially damage your gutters. It is always a wise idea to check your roof gutters each winter before snow begins to melt so you can fix any issues that may prevent your gutter system from working properly when accumulations of snow on your roof begins yielding to balmier springtime temperatures. Also, be sure to clear your roof gutters of leaves, seed pods, twigs, and any other debris that may have built up, ensuring that your gutter system can handle the deluge of water that will soon be trickling from your snow-capped rooftop.